Info "Hey, it's a KO! Hurry up with the count! 1990: Punch-out!! 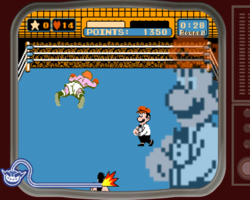 / NES"
Punch-Out!! is one of 9-Volt/18-Volt's Microgames in WarioWare: Smooth Moves. It is set in the NES game of the same name. The object is to have Referee Mario count to 10 (hence letting Little Mac win) by pointing the Wii Remote forward and back to count once. Level 1: Starts at 7, count 3 times to defeat Glass Joe. Level 2: Starts at 6, count 4 times to defeat Von Kasier. Level 3: Starts at 5, count 5 times to defeat Bald Bull. This page was last edited on February 20, 2018, at 17:14.